Here are some leaves I collected and pressed in an old Atlas. Fall is bright and sassy on the trail this week there are colors all around and I'm glad I got a few good pictures of them before all the rain. The rain knocks the leaves off of the branches. 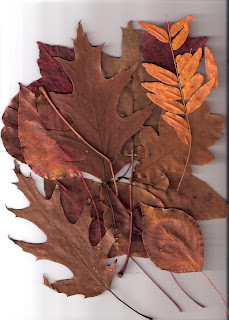 I love to collect and press leaves to use in my art. The leaves are there long after the trees are bare, and their shapes and colors inspire me. Fall has always been my favorite time of year, it is beautiful and the scruffy trail through the woods is transformed! I love the colors of fall, the bright clear air and the rush of critters scrambling to store up food for the winter or preparing for a long flight south. This season is also a little sad, because Winter is around the corner and soon everything will be frozen, the critters will be hiding and most plants will be in their dormant stage. Winters here are harsh and raw most of the time and white and fluffy only sometimes. I hope to get a fluffy one though then you can still see something when you go out for a walk. So here are some of my favorite views of fall and some of my quilts with that theme enjoy! The wildlife along the trail isn't all that wild, there are ducks and geese and even spring warblers, but there are also these two pigeons. There are people who feed the wildlife and so they are not so wild. Most people don't feed them white bread anymore, everyone has gotten the message that is bad for any life. However feeding encourages scavengers to compete for light and nesting space. Salt Creek Trail combines urban scenes and stressed natural areas, and a challenge to people who care about the environment. Spring is different along the trail. It is not like spring in my garden, there are no pinks or purples, no bursting blooms. There are no feathery limbs or blankets of lawn. It is greener much greener the creek is green, the trees shrubs and fields are green, green is everywhere. There are flowers, but you have to hunt for them, underneath the leaves and the shrubs. They are not pink or purple nor are they red. They are white or yellow, they are subtle understated and protected not showy, or loud. It's a rest for the eyes.